As Bourbon Heritage Month draws to a close this week, I’m taking a look at ways you can enjoy bourbon other than in a glass – although that is always recommended, of course. One delicious way is to order a Four Roses Kentucky Bourbon Pizza from Impellizzeri’s Pizza in Louisville. 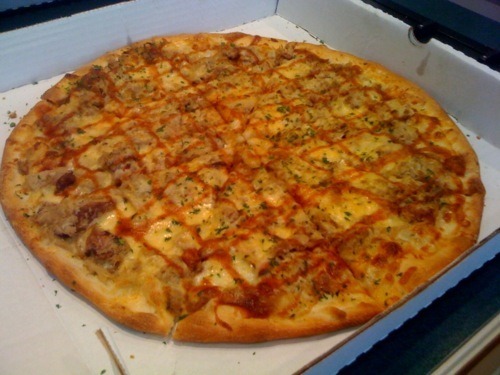 This thin-crust pizza features smoked pulled pork, caramelized onions, smoked gouda cheese and a Four Roses Bourbon barbecue sauce artfully drizzled on top in a checkerboard pattern. The Four Roses gives the sauce a sweet note that appealed to our whole family. “It’s like the best of both worlds,” my 12-year-old daughter said – “barbecue and pizza.” Even the 8-year-old, who’s a picky eater, enjoyed it. The Four Roses Kentucky Bourbon Pizza (size medium) is available through the month of October at all Impellizzeri’s locations. It’s $14.99.